Berwick gained a welcome and vital win with a 1-0 victory at Cowdenbeath, a result which lifted them two places off the bottom of the Scottish Second Division table. Leading goalscorer Steven Thomson headed the only goal of the game in the 84th minute. It was only Rangers’ second win in their last 12 outings, and despite all the despondency which surrounded their fall to the foot of the table, they now find themselves in eighth place, one of four teams on 21 points, and some might say, quite remarkably, only four points off the fourth-placed play-off spot. During the week, Berwick added to their squad by signing defenders Michael Dunlop and Gary Phillips from Arbroath. 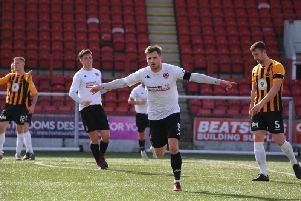 Phillps was handed a debut at Central Park, but there was no place in the squad for Dunlop, who is now in his second spell with the Shielfield Park outfit. The home side, who have now replaced Berwick at the bottom, went close twice in the opening 10 minutes through Nikolay Todorov and Lewis Moore, who both shot wide, before Lee Hamilton fired wide for Rangers from outside the box. Shaun Rutherford then also pulled a shot wide for Cowdenbeath before Gary Phillips had the ball in the net for Berwick, only to be ruled offside. As Cowden started to apply the pressure, Berwick keeper Kevin Walker twice had to come to his side’s rescue, saving from Kris Renton and Burton O’Brien. Kyle Miller went close from distance, whilst Steven Thomson had an effort blocked at the other end, but at half-time it remained 0-0. The second half got off to a slow start and goalmouth action was at a premium, the firet attempt on goal not coming until the hour mark when Rutherford fired over from distance for Rangers. Rutherford also had a shot blocked inside the box as Berwick tried desperately to break down the Fifers’ defence, and shortly afterwards, the striker was replaced by Jordyn Sheerin as manager John Coughlin tried to change things around. Phillips managed to get in behind the home defence and fired the ball across the face of the goal, but there were no takers. In injury time Shaun Rutherford went close to snatching a late equaliser for Cowdenbeath, but again Walker was equal to the effort and Berwick held out for what was a welcome and vital victory. Berwick Rangers: Walker, Hamilton, Scullion, Fairbairn, McKinlay (Stirling 88), Notman, Thomson (Orru 89), McKenna, Lavery, Phillips, Rutherford (Sheerin 74).